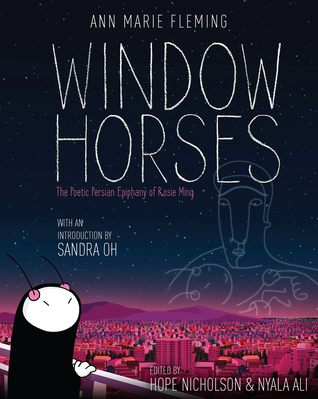 Window Horses is the graphic novelization of a 2016 animated film of the same name, written by Ann Marie Fleming and starring Sandra Oh (with what I can only assume is a brief cameo by Ellen Page, at least judging from the book). The story's protagonist is a young biracial woman named Rosie Ming. 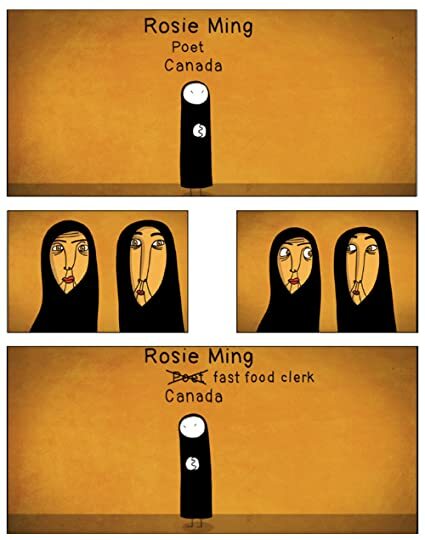 Born to a Chinese-Canadian mother and an Iranian refugee father, Rosie was left in the care of her maternal grandparents after her father abandoned his family and her mother died in a tragic accident. Fast food worker by day, Francophile by - who are we kidding, 24/7 - Rosie keeps her poetry a secret. That is, until she's invited to a poetry festival in Shiraz, Iran. Having self-published but one book of poetry, Rosie has no idea how the festival's organizers discovered her. Though she's nervous to travel to her father's homeland - she's never even been outside of Canada, for pete's sake - and is plagued by imposter syndrome, Rosie knows that this is an opportunity she simply can't pass up. Little does she know how truly life-changing the trip will be. Window Horses is a sweet and heartfelt story: about the bonds of family and community, the stupid and even selfish things we sometimes do for love, and the power of words and poetry, with a little bit of a history/civics lesson thrown in, to boot. The art - primarily done by Kevin Langdale, with poems illustrated by a variety of other artists - is stunning. I especially loved how the breadth of different contributors and styles played off the poetry, adding extra depth and nuance. The only thing that rubbed me the wrong way? Dietmar, or rather Mehrnaz's insistence that he's only rude to Rosie because "that is the way some young men are...," you know, when they like a girl. Boys will be boys and all that nonsense. Blecht. Sign into Goodreads to see if any of your friends have read Window Horses.